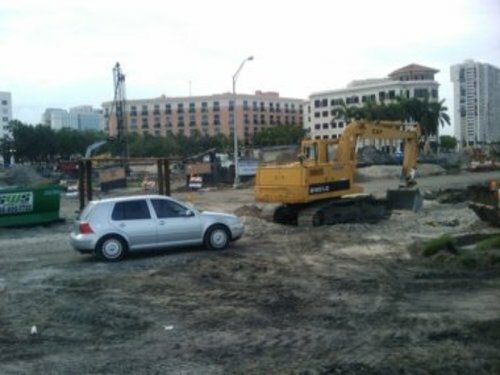 In mid-July 2009, now that the old library has been completely demolished, the Clematis Street waterfront project is in full swing. Flagler Drive has been closed off to traffic from Clematis Street to Fern Street. 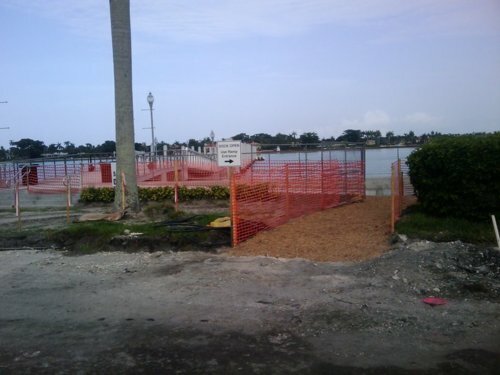 However, the area is still generally open to pedestrians, so that the public boat docks can be accessed. This also allows WALKINGCLEMATIS to take regular pictures of the progress from within what looks like a construction zone. 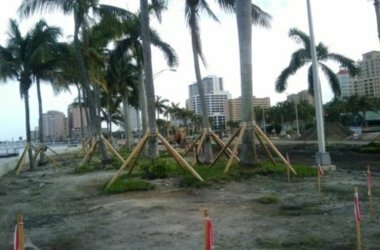 When Flagler Drive was closed off to traffic, the City announcement didn't mention the waterfront project as the reason; it simply mentioned stormwater drainage improvements. However, it appears that at the same time these improvements are made, the waterfront project will be accomplished. This involves moving Flagler Drive farther west in front of Clematis Street, so that there is a large area available for the waterfront park directly in front of the intracoastal waterway. It looks like, in the section in front of Clematis Street, Flagler Drive has already been ripped apart (including the grassy median) so that it's no longer clear where the road was. Hopefully this is a sign of progress toward the eventual moving of the road toward the west (i.e. 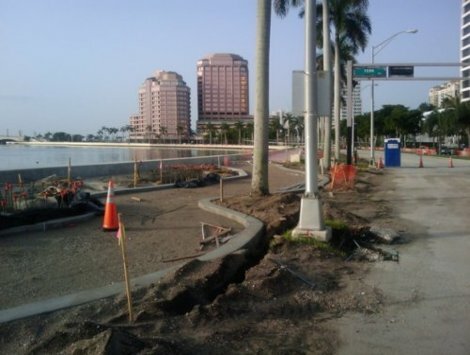 the original road, which hugged the intracoastal, may be gone for good). Below are some pictures of this. Most of them were taken from directly at the intracoastal waterway, so you can see that there is little sign left of the existence of Flagler Drive, i.e. 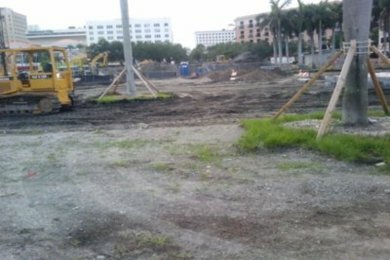 the construction zone where the old library once stood is now blended in with the area where Flagler Drive once ran as one large construction zone. 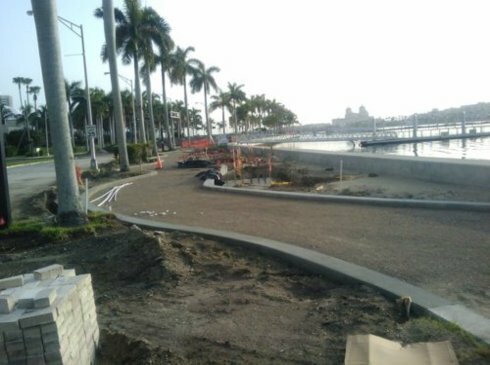 The second picture below shows the nice little walkway that has been created so that people can get through the construction zone to the main public boat pier at the end of Clematis Street. As of July 19, 2009, construction continues on the waterfront project. 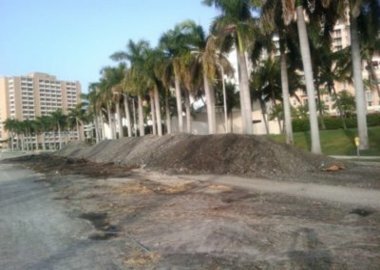 The first picture below shows some large piles of dirt in the middle of the road around Flagler Drive and Datura. The next two pictures show the first signs of some of the nice new landscaping that will be coming in. You can see the beginnings of a new winding waterfront pathway.